You have read 5 stories this month. After 15, you will need to register or subscribe. 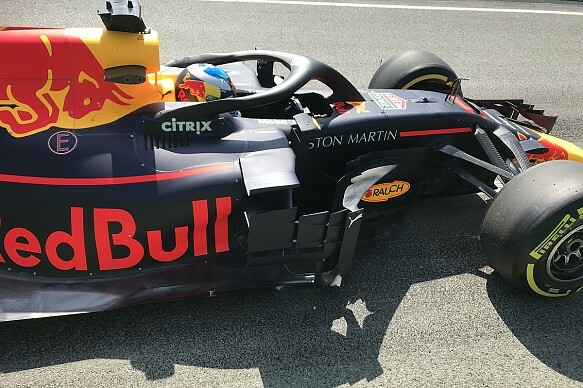 Red Bull introduced a major Formula 1 upgrade package during Spanish Grand Prix free practice, including revised sidepods, bargeboards and floor. 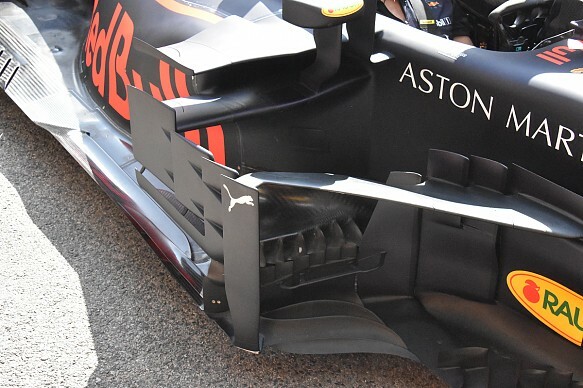 The bargeboards have a new forward footplate, while the angled outwash vanes have also been revised. This is supplemented by a new slotted element that bridges the main bargeboard panels to the floor and deflector. Above this, the boomerang winglet has been revised to feature the necessary slots to mirror the aerodynamic appendages directly beneath - a requirement of the regulations. The leading edge of the floor, which since the Hungarian Grand Prix last July has featured three floor strakes, is now supplemented by six strakes. These strakes help to clean up the turbulence created by the tyre and aerodynamic surfaces ahead of them, improving the performance of the floor and diffuser. Internally, the team has improved the position and shape of some of its ancillaries so airflow through the sidepods can be improved. A redesign of the car's mid-section was the point when Red Bull really started to unlock the potential of last year's car, but it remains to be seen whether it can repeat such a big gain at an earlier stage of this season. Daniel Ricciardo and Max Verstappen were second and third fastest during Friday's second practice session using the upgraded car. Verstappen was encouraged by the updates, which worked well, but is unsure how much performance has been gained. "The car has been working well," said Verstappen. "The updates have been working, which is always good. "How competitive we are is still a bit difficult to say, we really have to wait until tomorrow." Ricciardo suggested the different feel of the car was a contributing factor to his Turn 4 crash during the first session. But he's confident there is more to come as Red Bull fine-tunes the set-up to harness the improved performance after an encouraging second session. "The car felt pretty different straight away, and I think that showed," said Ricciardo. "We cleaned it up this afternoon and it was not bad in the end. "We've obviously got a lot of updates on the car and we are still figuring out how to optimise those, but we don't seem too far away. "We can still make the car a bit better, so that's encouraging."